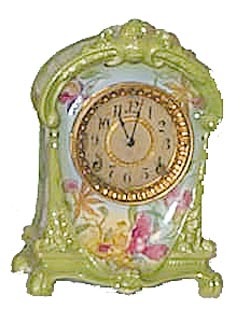 Ansonia Clock Co., Royal Bonn case, "LaCruz", ca 1904. The Royal Bonn stamp and the name, LaCruz, are painted in red and the name was also engraved in the case before it was fired. No back door, but correct pendulum. Case is 11 1/2 inches high and has no chips or repairs. Colors in the New Art Tints, apple green, rose, yellow, blue flowers on front and sides. Reminder that the back door and other Ansonia parts can be ordered from Timesavers.Standard Ansonia movement is 8 day, half hour gong strike. It has the American sash, a paper dial that is original and signed. Ly-Ansonia No.2685, No.2691.